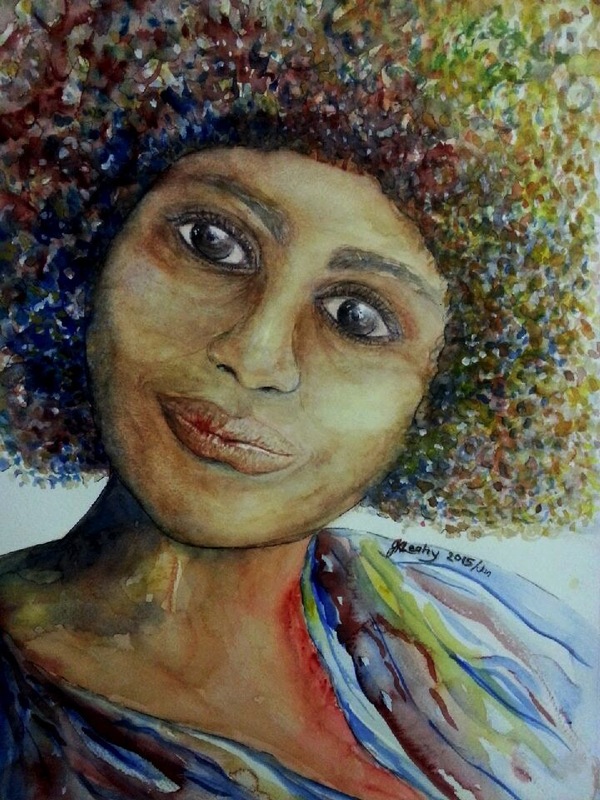 I had a watercolour technique class tonight in Bellbowrie, Queensland, on skin tones and the weird drawings under this image are quick demos for my students on how to draw an eye, curly hair and corn-row etc. So, don’t get distracted by the massive eye – I thought it looked cool as part of my subject’s hoody (sweatshirt). This subject has a mid-tone and as I explained to my students, I usually subconsciously draw a person that ends up looking like someone I know and has my skin colour. This guy definitely looks like one of my relatives. The image is slightly overexposed because I took the picture with my phone and the flash. I hope you like the study. 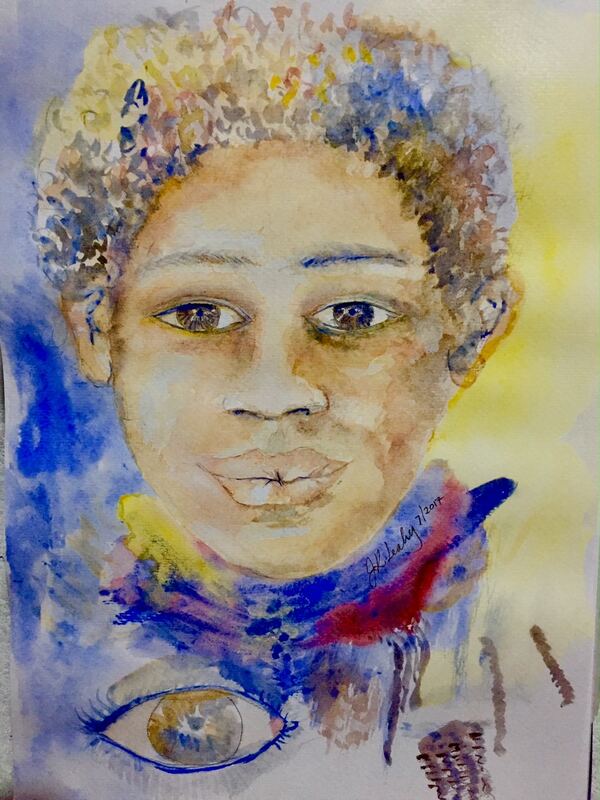 Experimenting with a watercolour – gesso combination, I painted “Island woman”. She reminds me of someone from my past in PNG New Guinea islands – maybe from New Britain or New Ireland. Like other mediums, watercolour paints have names and pigment intensity. This Aussie Red-Gold (Daniel Smith) paint has to be my favorite, but I use Payne’s Grey in almost everything, so I had to prove to my students, I could easily divorce Payne’s Grey for another colour. I think it is a brilliant colour. I hope you like it too. Bird of Paradise watercolour by J.K.Leahy. 420mm x 297mm on 300gms paper. Papua New Guinea has over 30 species of the Bird of Paradise. 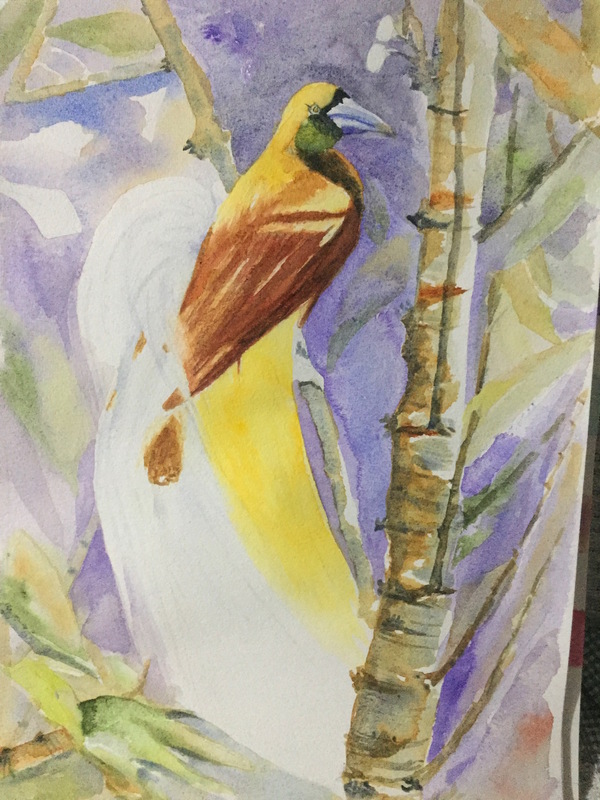 I am currently painting this study of the male Lesser Bird of Paradise. I think my next one would be better. What do you think? 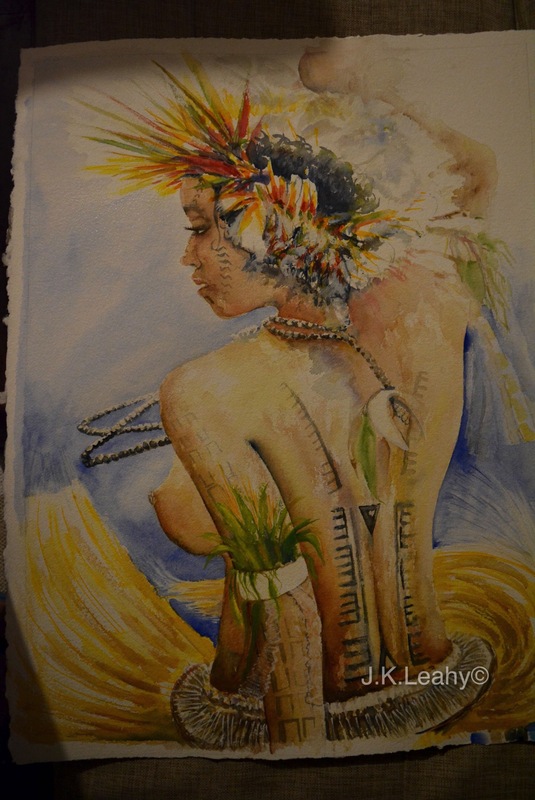 Anyway, I think I have almost got the Kina shells right, but the challenge of the feathers takes time. It also gives me more pleasure to learn and practice. 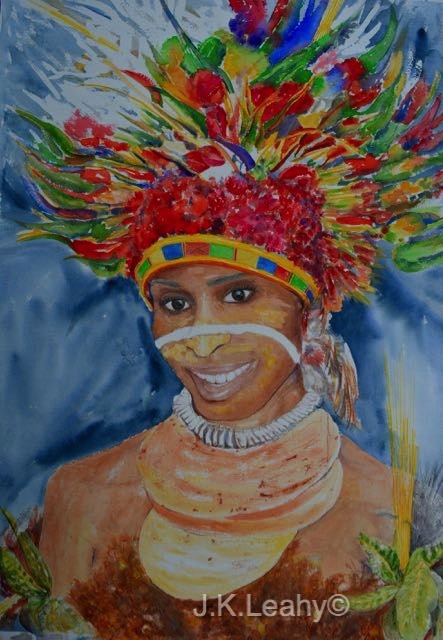 Google Papua New Guinea culture if you want to see some real headdresses of fantastic colours, shapes and feathers. I hope you like Meri Simbu II. I painted Meri Simbu the first six years ago and due to her popularity, it was no surprise when a client asked me for a new version. Meri Simbu II is about 800+mmx1200+ big, so I have to do small sections and pay attention to the details at the same time. The first Meri Simbu was no larger than an A4 paper size. I will be back to stories soon. Thank you for continuing to visit the Tribalmystic blog and thank you to all those who have emailed personally me and for the birthday wishes for today. This is a work in progress. 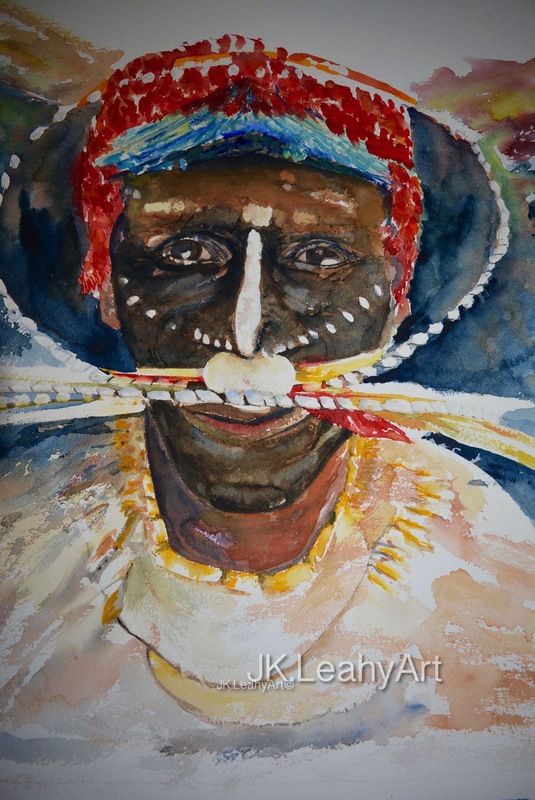 Old man from Simbu, Papua New Guinea is a painting challenge to myself to paint larger (work) with better light and skin tone. I love the traditional dresses and particularly the headdresses from Simbu, a highlands province that is very rich in culture. 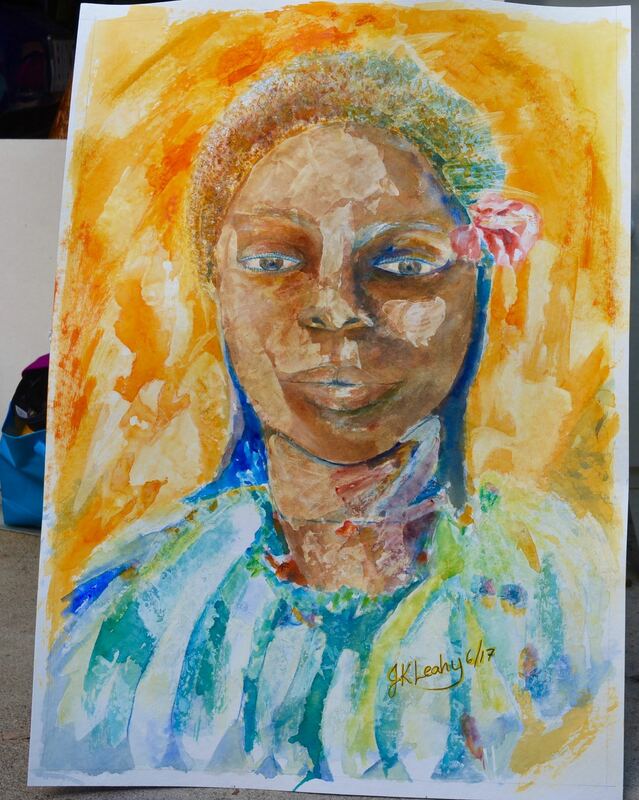 I painted a young woman from Simbu a few years ago and was asked, why haven’t I painted a male from the same area. Good question. I had never thought of it. So I picked up the brush, filled the re-cycled jars with water…and, am still working on the old man from Simbu. I found this exercise exhilarating because to get the painted black face separated from his normal brown skin and give him a background – all in dark colours was tricky. I hope you like him. From my friend Joel Savage’s blog. Africa is a large continent influenced by different cultures, customs, traditions and ideas, which are often presented or crafted as images. 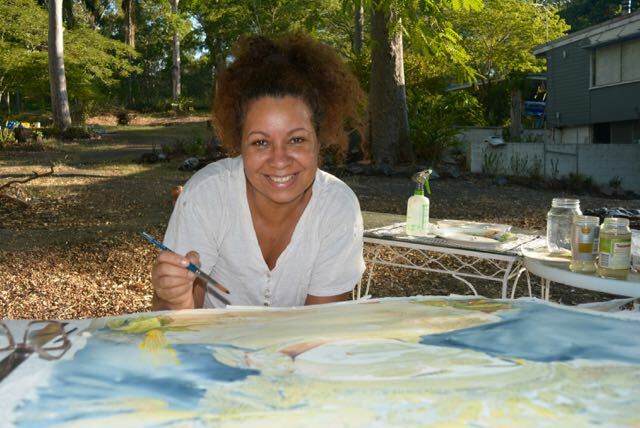 The creative artists in the continent produce wonderful and amazing paintings adored by tourists worldwide. One of the Ghanaian artists who has made a name for himself is Wisdom Kudowor. Known as a trans-cultural visionary, his work is influenced by the human form as a transformational agent and ancestral wisdom as an aesthetic tool. Travelling out to exhibitions transformed Kudowor into knowing he could “tackle other things and create something admirable out of them. My Cootha is one of my favourite places in Brisbane. My closest friend and my son’s godmother Marina works in the temperate gardens. 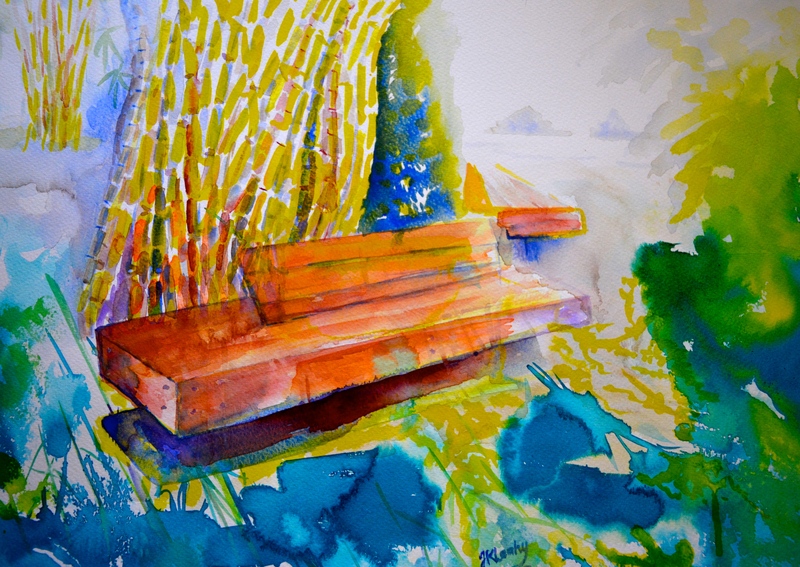 Often when I visit her, this wooden contemporary bench is where we sit and have lunch. I painted this watercolour for her as a gift. The poem is just an observation of people who come to sit in the temperate gardens.